Monochromatic Mauve shimmer cs. This card is really fun to make. The dies are from Stampin' Up! Botanical Builder Framelits. To start you will need one sheet of 12 x 12 cs. Cut at 4.25" x 11". Score at 5 1/2" and fold. Set aside. Use the remaining cs to die cut 2 of each of the flowers and 2 of the frilly frond. Make your flowers. I adhered with dimensionals. Then I added the pearls from Stampin' Up! This would make a lovely Mother's Day card or even a sympathy card. 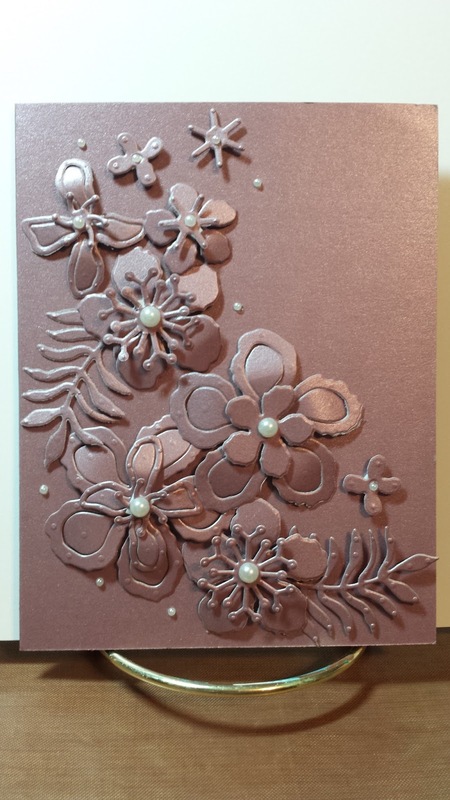 You can choose any color cs to make this monochromatic card. Labels: Botanical Builder Framelits, dimentionals, Monochromatic, pearls, Stampin' Up!